Are you looking for a RGB LED Strip with more options? This upscale RGB LED Strip has them all! it comes with a 44 key programmable remote for extra bright, extra crisp colors!. This RGB LED Strip is completely flexible, you can twist it into any shape. RGB LED strips offer creative options for upgrading the lighting of any room. Our LED strips can be used to set the mood in bedrooms, living rooms, conference rooms and office reception area. It’s also the coolest way to decorate any vehicle, bar and display counter. 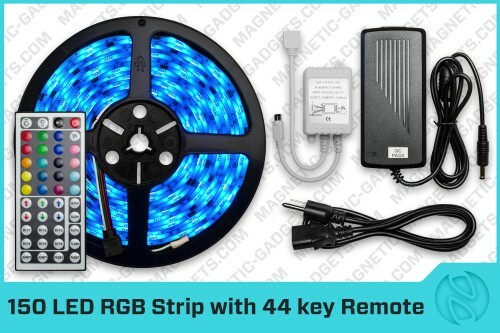 Our RGB LED strips are self adhesive and connect with simple plug and play connectors. LED Strips are great for creating the perfect lighting for everyday living to party lighting. In this video we show you how to connect your LED strip. The model shown is the 150 LED strip with the 24 key remote. Do you have any questions about our RGB LED Strips and LED Gadgets? Do you have a project in mind and need some assistance to make it work? Do you want to connect multiple LED Strips together and install them around your house? Are you renovating your house or condo and want to add a magical touch to your living room, kitchen or bathroom? We will be glad to customize your order based on your personal needs.